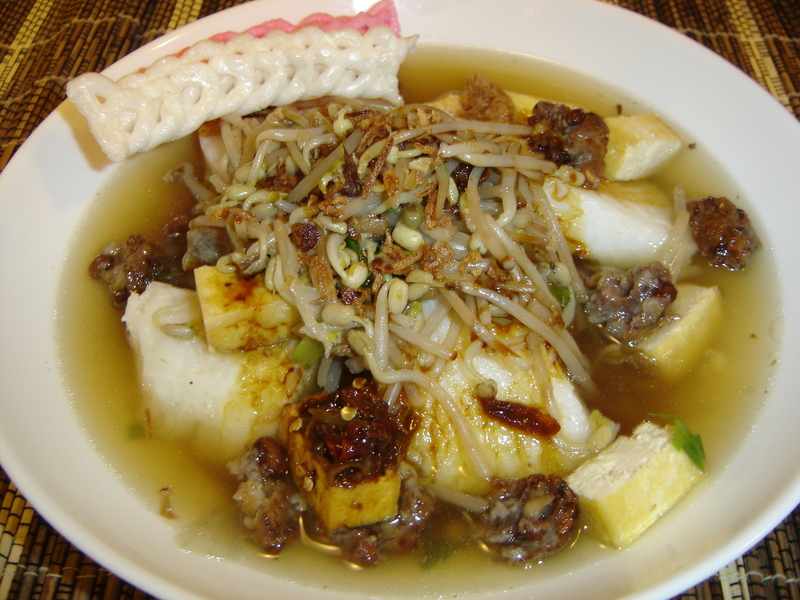 Lontong Balap is one of traditional meal from East Java, very popular, especially in Surabaya. According to its name consist of slices of lontong (compressed rice), added with bean sprouts soup, fried tahu (fried tofu), lentho, sweet soy sauce, and sambal petis. Why it is called lontong balap (Balap in English mean Race)? This name emerges from the style of lontong balap merchant in the past. All merchant used the big bamboo stick accommodating two clay frying-pans. Big size measure, it is clear weight shouldered. As a result, the merchant have to quicken its journey, provoking race. Since then, the term of lontong balap was emerged. I like it very much. When I was still in Surabaya, I had it almost every week for breakfast or lunch. I can easily get it. But here, no one is selling it. So I have to make it by myself. And my mother gave me the recipe how to make it. This meal is a perfect dish for one who doesn’t eat meat (vegetarian). However, I was very surprised my hubby likes it. He said when he ate it, it tasted like eating rice with vegetables and meat. – Lontong (compressed rice), check the recipe here. 1. Boiled the beef meat with 500 ml water until you get the beef broth. Take out the meat. 2. Blend or grind the shallots, garlic, salt and pepper. Then heat the oil and sauté the paste until fragrant. 4. Form into oval small dough. Fry in deep wok over medium heat until crispy. Remove from the pan. Cut into pieces before serve. 1. Fry the garlic and the chillies. Set aside. 2. Then blend or grind them with dried shrimp paste (petis udang). Add the water and sweet soy sauce (kecap manis), mix them. In a plate, cut lontong into small pieces, then add the bean sprout, lentho, fried tofu and garnish fried shallot. Pour the broth, and then drizzle with sweet soy sauce. If you like it spicy, add the petis sambal.